By Prof Morag McDermont, Professor of Socio-Legal Studies, and Mr Ben Crawford, Knowledge Exchange Fellow (University of Bristol Law School). Research led by Prof Morag McDermont of University of Bristol Law School has explored the ways in which advice organisations such as Citizens Advice (CA) have become key actors in legal arenas, particularly for citizens who face the most disadvantage in upholding their rights. Findings from a four year study in partnership with Strathclyde University, highlight the importance of free-to-access advice in enabling people to tackle problems and engage with the legal and regulatory frameworks that govern their lives. 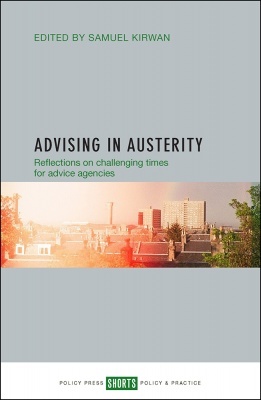 The advice sector, however, is under threat, as a new book Advising in Austerity: Reflections on challenging times for advice agencies (edited by Samuel Kirwan and published by Policy Press ) demonstrates. The book, co-written by the research team and advisers in the field, highlights both the possibilities and the challenges for an advice sector that largely relies on volunteers to provide a vital interface between citizens and the everyday problems of debt, health, employment and much more. Despite the skills and enthusiasm of the workforce, many services are caught between rising demand and large-scale funding cuts, as traditional sources of revenue from local authorities and legal aid are dramatically reduced. Across the network, reductions in core funding are forcing agencies to reduce or reconfigure services. In particular, the face-to-face, generalist advice model that provides a holistic assessment of client’s problems is under pressure as services are reduced in favour of telephone or online support.